38/4.2. The belt in atmospherea where these things happen is usually about five or six or seven hundred miles up from the earth's surface. But the belt sometimes ascends a thousand miles. But at farther distances upward other belts exist; and others still beyond, and so on. 38/4.3. Another result that happens from these overlapping currents in the vortex (but closer to the earth) is the production of rain, snow and hail. Certain parts of the earth are given to snow; certain parts to rain and hail; and other parts to drought. In drought regions the vortexian overlappings descend to the very earth, where they are called by various names, such as cyclones, whirlwinds and so on; but if they occur on the ocean, carrying a current of water either up or down, they are termed waterspouts. In regions where there are rain, hail and snowfalls, the vortexian commotion takes place from half a mile to three miles above the earth's surface. Here the discord results in liberating the moisture, which was in transparent solution, and clouds result. But if the commotion continues, these are, atomically, still further liberated, and rain, snow, or hail results, which is carried down to the earth. 38/4.4. The places in the vortex of the earth where these discords result are nearly uniform in their relative distance from the earth, and their occurrences correspond to the prophetic periods previously given. 38/4.5. 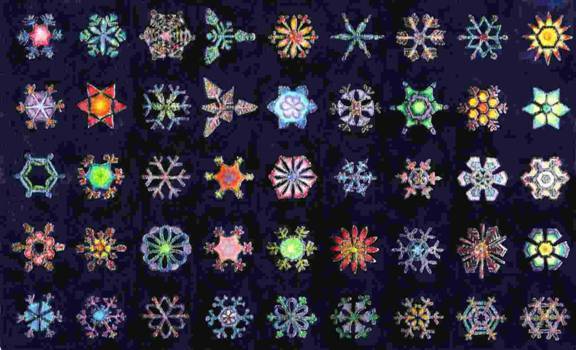 Refer to the Snowflakes image i003 (with text), where a variety of representations of the forms and figures of snowflakes will be seen. But these are not all; there are billions of them, differing so much from one another that description is not possible. 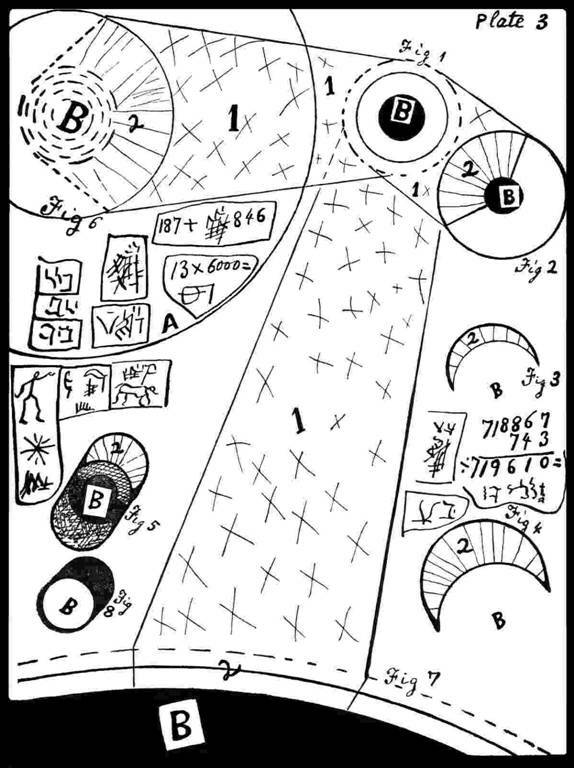 As previously stated, corpor being in solution in ethe, has mostly the shape of needles, |1654| but of such infinitesimal size that corporeal knowledge of them can only be, at most, subjective knowledge (indirect). But the patterns of snowflakes reveal both the casting and the mold of discordant m'vortexian currents. 38/4.6. But it must be borne in mind that where one snowflake is molded in one moment, another snowflake molded in the same place the next moment, and so on, would display no two snowflakes alike. Three stages may be described in the discordant results: first, the cloud; second, the frozen cloud, which is snow; and third, the raindrop or hailstone. 38/4.7. 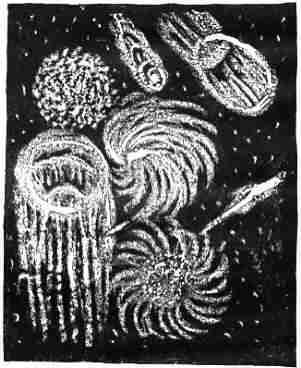 In the meteoric regions (which are above the clouds that produce rain) corpor also presents three stages of development, which are: Ash‑clouds, transparent or otherwise; and crystal needles; and meteoric stones. The latter only, as a general rule, are precipitated to the earth. But on certain occasions, both the other forms of corpor are also precipitated to the earth. 38/4.8. 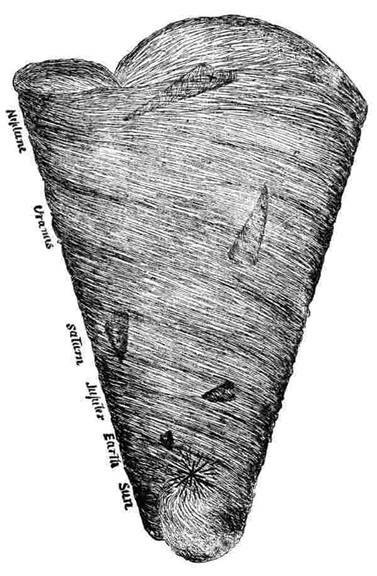 Allowing a certain size to rain clouds, which are near the earth, by contrast corporeal clouds high up in the vortex are proportionately larger: According to the ratio of the difference between their globular circumference and that of the lower strata, so are the discordant waves proportionally longer, wider and deeper. 38/4.9. It is an error to say that the atmosphere of the earth decreases gradually and continually in specific gravity according to the distance above the earth. But the point now considered is the commonly expressed knowledge of men, that the atmosphere has less density outward, away from the earth, in proportion to the distance from the earth's surface. In one respect this is an error; in another a truth: As to density per se there is no difference in the atmosphere on the face of the earth compared to that of a thousand miles high, or a hundred thousand miles high. It is all in even balance, as to pressure and density, per se. 38/4.11. Therefore the gravity (so‑called) of the atmosphere refers only to imperfect solutions of corpor. |1656| And it is true that a superabundance of these imperfect solutions are near the earth. 38/4.12. At sea level, a certain pressure seems to manifest, as in a barometer; on a high mountain a less pressure seems to manifest. There is also a variation in the barometer according to certain conditions of the atmosphere [high and low pressure areas, as meteorologists use the terms]. The difference is not that the pressure of the atmosphere is different; the pressure of the atmosphere, per se, is the same in all directions, high and low. The cause of the variation of the barometer is in reference to distension |1657| (sublimated solution of corpor), and has no reference to pressure as such. |1658| This capacity to distend is not only external to the barometer, but within it also; so that as a measure of atmospheric pressure per se it is entirely worthless. The suction pump, or inverted tube filled with water, shows the pressure of the atmosphere upward as well as downward, and shows what the pressure is. 38/4.13. From which it is shown there is no such thing as attraction of gravitation of the atmosphere toward the earth more than away from it. Where the atmosphere is overcharged with an imperfect solution of corpor, snow, or rain, that excess is that which balances toward the earth. But this also only applies in regions close to the earth's surface. For, fifty or a hundred thousand miles up from the earth, the axial velocity of the vortex is so great that rain or snow would instantly be dissolved, distended and lost to sight. Consequently the solutions in the higher atmosphere contain not only moisture, but they contain sublimated iron, lead, zinc, gold, platinum, clay, granite, diamonds and all other things known to exist on the earth, and many other things besides. 38/4.14. In the early age of the vortex of the earth, the outer rim flew so swiftly that border eddies ensued, from which nebula congregated, until the earth had a nebulous belt around it. This belt, in time, losing pace with the earth's vortex, condensed and made the moon. 38/4.15. But to return to the snowflake, and to the needles of corpor while in the etheic solutions: On a cloudy day these solutions or needles are more or less transverse |1659| to the vortexian lines. During a clear day the needles are linear to the earth, and this is the reason it is a clear day. |1660| The latter direction of the needles may be called direct, and the former indirect. Where they are direct, and fall on a photo‑plate [photographic film or photovoltaic (solar) cell], the force of their blows is called actinic force, |1661| and it is the same as where they fall on the wet linen in the bleachman's field. In this actinic blow a weak electric flame is produced by each needle, which is the bleaching power, and also the power to blister |1662| an exposed skin, which has been kept for years in the dark (negative). 38/4.16. If a solution of transparent iron, or of quinine, or other recipient of negative electricity, is sprinkled on the cloth, the actinic ray will not result in the electric spark, and no bleaching effect will be produced; and even, sometimes, on the contrary, a black spot will result. 38/4.17. Wherever the vortexian current falls, corpor is more or less damaged or dissolved, or changed in its combinations. On a piece of freshly broken iron, it produces rust. Because the vortexian solution contained oxygen, this effect has been called oxidation. Nevertheless, in point of fact, oxygen of itself is inert: The break of its needles liberates vortexya, which results in a minor discharge, a larger representation of which is seen in the discharge of an electric spark from the pole of a battery. 38/4.18. As previously stated, the vortexian currents are to the earth in the daylight; and from the earth in the night; although their force is toward the center of the earth and toward the north pole afterward. The following result happens: Take a pool of water, for example; it is charged during the day with the positive current, but during the night the negative current escapes upward from the water. The resulting decomposition is called se'mu, a mucilaginous substance that floats on the surface of the water. In a few days this se'mu, by motion, assumes certain defined shapes, crystalline, fibrous and otherwise, like the strange configurations of frost on a windowpane. A few days after this, if the se'mu [green scum] is examined with a magnifying lens, it will be discovered that here are miniature trees, even forests, with vines and grasses. No seed was there. 38/4.19. This new property is called Life, and because it exists everywhere it is called Omnipresent. Man can account for the se'mu; for the positive and negative forces; for corpor and for ethe; but Life is unfathomable |1663| by man. If the se'mu floats against the ground, its infinitesimal trees, vines and grasses, take root and grow, and live a season and die; but from their roots and seeds a larger growth succeeds. In that way, the whole world becomes inhabited with living creatures. Nevertheless not one of them merges into another; but every one brings forth after its own kind. 38/4.20. Man inquires of the earth, the rocks, the air, and of all things: Who is this Life? This Omnipresent, quickening into life all the living? But none can answer him. Then man inquires of Life: Who are You, O Life? And the answer comes to the soul of man: I am Life! I am the I am! I am the Ever Present! All that you see in earth or heaven, and even the unseen worlds also, are My very Person! I am the Whole! 1655 That is, atmosphere has commingled in it, both, corporealized substance and dissolved substance; accordingly the density, per se, of atmosphere is not changed by the percentage of substance in it that is corporealized; but man's corporeal senses or its extensions (devices, equipment) register the presence of corporeal substance only; and thus register the density and weight of the corporealized substance in or of air. 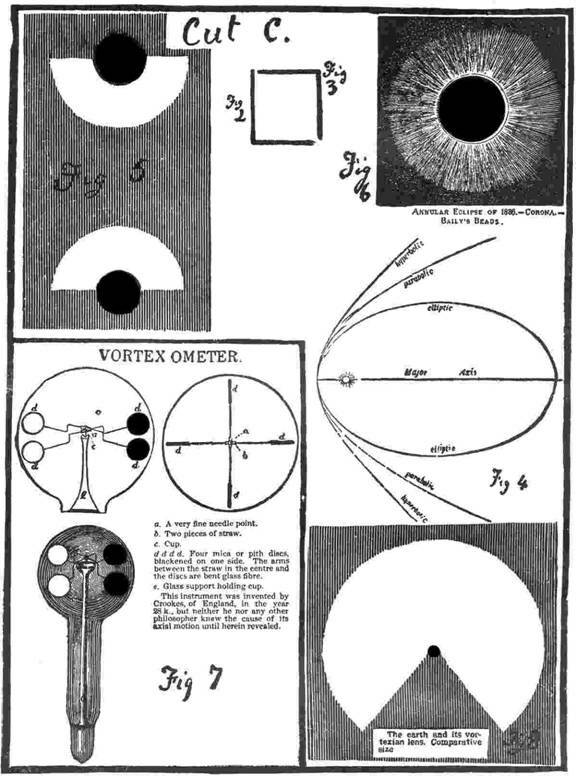 1656 Imperfect solutions have some combination of dissolved and undissolved corpor within them; and the closer one gets to the earth, the more there are of the undissolved corpor within them, and hence the measurements by man's instruments show the atmosphere to be denser closer to earth. 1658 Apparently this means, the amount of sublimated corpor in solution (proportion of sublimated corpor versus undissolved corpor) determines the so-called barometric pressure. 38/5.1. All kinds of colors are produced in the transposition of needles of corpor from parallel polarity to mixed or transverse positions. It is an error to say: Wave of light or bent ray of light, or that a given number of vibrations or undulations produce different kinds of colors, there is neither wave nor undulation in fact. Needles are arbitrary and cannot be bent. Compare a needle to a transparent glass crystal. Place a given number of these end to end, touching, and in a line: To bend this line is impossible, except at angles, for where every two ends join there will be an angle: No matter how short the needles, there will be no bend in fact, but a succession of arbitrary lines and elbows. 38/5.2. This is not, however, the juxtaposition, except when they are in a direct line; otherwise the ends of the needles do not bend like joints, but each one turns more or less on its own axis. If they all turn, an apparent wave is produced, expressive of a certain color; if part of them turn, another color is produced. In proportion to this disturbance, so are the apparent vibrations slow or fast, to mortal observation. 38/5.3. In regions of the earth's atmosphere where they have cyclones, reddish lights appear in the firmament, even before the cyclone manifests on the earth. And these lights travel with the cyclone, manifesting great heat on the earth. In the monsoon regions, a similar manifestation occurs, but generally with pink or bluish lights instead of red, if over the ocean; but if over the land, a smoky-looking atmosphere results. 38/5.4. These colors, and all others, manifested in atmospherea, are not confined to the earth stratum, but they extend even to the outer extreme of the earth's vortex. And in many instances they are so high in altitude that their manifestations are imperceptible to mortal observation, except that, for example, the moon or the sun shines less brightly. When one of these transpositions is dark and is high up in the atmosphere at night, they say the moon is surrounded by a haze. And yet, meanwhile, the atmospheric stratum next to the earth may be clear. 38/5.5. The earth's vortex has millions of these strata, which are of various colors, shades and tints. When photographs (spectrographs) are taken of the moon or sun, these often interpose. If such a picture is taken, it deceives the observer into thinking he has taken a picture of the oxygen or hydrogen of the planet's (sun's or moon's) atmosphere. 38/5.7. As a vortex grows older, these disturbances, together with imperfect solutions of corpor, become less frequent. So, also, in the early age of a vortex they are more frequent and of longer duration; so that, at times, a red, blue, or other color of light, will overspread the earth for periods of a thousand or more years without interruption. And in some cases, darkness can occur for as long a period. Whatever living things, such as herbs, trees, grasses, and so on, that were quickened into life during darkness, were without eyes. Nevertheless, in this day, even these things turn toward the light; as plants and flowers placed in a window will manifest. 38/5.8. Where se'mu was quickened into life in lighter times, it focalized toward the light, and this focus was called an eye. And those that were thus quickened into life, and not attached to the earth by fibers or roots, were called animals. And the Life they inherited, gave them power to go about from place to place. So great are the powers of the eyes of some animals that they can see and distinguish in the darkest of nights. Such eyes are absorbents of vortexya, and they shine in the dark. 38/5.9. Hence the first organs of sense created in any animal were the eyes; about which it has been said, the eye is the seed of the tree of knowledge. The sight of the eye is the beginning of self‑creation, in acquiring knowledge; and it does so by going forth and staying at home at the same time. The sight of the eye is a miniature sun, sending forth and receiving vortexian power at the same time. Which may be proved by looking on the eyelids of a person sleeping, who will awaken because of it. 38/5.10. Since, then, the eye of man can go forth with intelligent power, controlling things, it has been concluded for thousands of years by the wisest philosophers, that an All Seeing Eye is the Cause and Creator of the whole universe, which is His Person. 38/5.13. But because they can mix, and because that mixture can propagate, all the races of man are one and the same in all their organs and capabilities. Now, as previously stated, |1667| white things manufacture a white atmosphere about them; while black things do not (being negative). The white give off, or radiate light and power; the black are not radiants. The white man's radiating power recoils upon himself, and he suffers with heat. So also with the white bear. The black man and black bear are the reverse. 38/5.14. From this rule it will now be plain to the student: When a planet has attained to so great an age that she no longer gives forth light or heat to radiate upon herself, she cannot be seen (as a star) in the heavens. There are millions of these kinds of planets in the etherean firmament. Some of them move slower than any of the planets man can see. Some of these, at times, eclipse the sun and are taken for sunspots, although, perhaps, not a million miles from the earth. 38/5.16. In prophesying [estimating --Ed.] the tendency of a planet's approach to death, refer once more to the moon: Now the moon has, as to the earth's face, no axial revolution. But it must be remembered the moon cannot go around the earth without making an actual axial revolution. Seventy and one‑half revolutions of the moon's vortex complete one travel around the earth's vortex. Consequently we arrive at the exact speed of the moon's vortexya and the strength of light and heat manifested on the moon. The student should make allowance for the moon's ellipse (elliptical orbit), for the light of the moon is much stronger (as seen from the earth) some times than others. 38/5.17. Place the se'muan age at ninety‑nine degrees (Fahrenheit scale), the time of quickening animal life. It will be found that the moon, in that period, must have had an axial motion, facing the earth, of three and four‑sevenths' times faster than the earth. While at the same period of time, the earth made its daily revolution in what would now be twenty‑one hours and forty minutes. This would give a difference, in animal heat, of two and a half degrees of vortexya on the earth of today, as compared to the se'muan age. Consequently large animals, which are now extinct, had a temperature (average) of two and a half degrees higher than at present. By which we perceive that three hours and seventeen minutes' loss in axial motion produced a loss of two and a half degrees of vortexian heat. 38/5.19. To find the se'muan age of man, place his temperature at ninety‑eight (degrees Fahrenheit) for optimum health, and one hundred and two at inflammation or death. Four below normal will, therefore, be the end of the period of man's inhabitation of the earth. After the vortexian radiation reaches this period (94° F), man will cease to propagate, and, so, become extinct as to the earth. 38/5.20. This gives man eight degrees of vortexya as the sum of his existence. One degree is equivalent to twelve million seven hundred and sixty thousand radii c'vorkum. The serpent's coil would be one and one‑fourth. That is, twenty‑four thousand years |1670| to the time of completion. Thus, 12,760,000 divided by 260,000 add 1,402 ½ add 24,000 x 3 = 76,750 years, the time of the se'muan age for man. To this should be added one cycle, of, say, three thousand years, which was the beginning of the fall of se'mu. 1665 Thus the race Asu was created with a variety of skin colors. Asu mated with angel, and offspring race I'hin varied in color. I'hin mated with Asu, and offspring race Druk varied in color. Because the various colors can intermix (38/5.12-13), so, again, when speaking of skin color as regards a race, it is as statistical modes (see 06/2.3<fn-stout>. 1666 The verse is talking about the fact that in living with themselves (that is, blacks begetting only with blacks, whites only with whites, etc.) then the skin color will not change. It only changes when the different colors mix with each other, black marries white, copper marries browns, etc., as it says in verse 13, and then we have mixture of colors. Otherwise the skin color does not change. However, the different colors have commingled many times in the past, and in kosmon, this continues. 1667 This was not previously stated explicitly in the published text. The mortal editor of the original Oahspe edited out some material, apparently to reduce the size of the first published edition of Oahspe (1882). 1669 Note this means the moon has an atmosphere. Yet earth scientists have thought there was none, till the space missions to the moon in the latter part of the 20th century proved there was a moon's atmosphere, even though slight compared to earth's. 1671 Both 1882 & 1891: ... or 3‑340ths of ... [Note that 3-340ths was the way fractions were written when Oahspe was published, which today would be written 3/340ths. But the mathematics show that this should be 3/34ths of a second or possibly 3/39ths of a second. 100 minutes = 6000 seconds. Therefore, 6000 sec ÷ 78,000 yrs = 0.076923 sec/yr = 1/13th second per year = 3/39ths of a second per year; whereas this verse says it is 3/340th sec/yr, which would equal 0.0088235 sec/yr. This latter would be correct only if the total decline for 78,000 years would have been 11 min. 28 1/4 sec. instead of 100 minutes. But if 100 minutes is correct and not an error, then 3/340 is an error. Since 3/34ths (0.088235) is fairly close to 3/39ths (0.076923), which is only about one part in a hundred difference, we see that 3/34ths may be the more accurate measurement in preference to 3/39ths which is derived from undoubtedly rounded figures: 78,000 is one average measure of 72,000 years of Seffas (3 average gadols of 24,000 years each) plus 6000 years of Asu (see 06/2.1); also the 100 minutes may be rounded. And so 3/34ths is preferred to 3/39ths, and also had it been this latter it likely would have been reduced to 1/13th. 38/6.1. To return to the master vortex; refer to image tow'sang (image i073) (with text). It is an error to say that the eye sees the sun by means of a straight line. The line of sight to the sun is spiral and oval. But it is equally an error to say that light comes from the sun to the earth, or to any other planet; which has given rise to the still greater errors of calculating the time of travel of light, and the degree of heat of a planet by its proximity to the sun. 38/6.2. To determine the distance of the sun from the earth, allowance must be made for the vortexian spirality. By which reason, the sun is, in fact, some seven million miles nearer to the earth than its measure would indicate. |1673| The same measurement rule applies to all planets except the moon. And even this is seen by means of the curved lines of the earth's vortex. 38/6.3. As the moon's vortex rides around in the outer part of the earth's vortex and we discover the moon's elliptic course, so, similarly, we can discover by the roads of a comet, the spirality and curve of the master's vortex. Observe a comet in different positions as it follows the sun's vortex. 38/6.4. When the head of a comet falls within the overlapping waves of the sun's vortex, the head is sometimes swallowed up, and sometimes driven backward, spitting flames of fire the entire time. The nearer the comet approaches an elliptic course, the longer it will live; the opposite condition applies to hyperbolic comets, for they often die or dissolve in one journey. If a comet is seen today in hyperbole, and in any angle of the heavens, |1674| and if, in ten years or a hundred years, a comet is seen in the same place, it would be an error to say it was the same comet. 38/6.5. It is an error to prophesy [estimate --Ed. ], the heat of Venus being more or less because of her approximation nearer the sun. There is no more heat in the master vortex in general, than there is a hundred miles above the earth, except when very near the sun's photosphere, that is to say, within one or two thousand miles at most. 38/6.6. There is a sun planet in the center of the photosphere, at a distance interior, from three thousand miles to thirty thousand miles, |1675| and it is light all the way around. But within the body of the photosphere there are numerous planets, some globular, some elongated and irregular. |1676| These are usually called sunspots; because when they present their negative surface [shadow side or cooler side] toward the earth they seem black. For the most part, these planets in the photosphere are rather external [near the outer edge of the photosphere] than internal at the times they appear as spots. |1677| They have independent motions [orbits, axial motion, etc. --ed.] in their respective places. 38/6.7. From which it may be said: When an unlearned man says: The Sun, we know what he means; but when a learned man says: The Sun, we do not know what he means, whether the whole central group, or the sun planet only. 38/6.10. It is an error to say the sun threw off rings or planets. No thing has power to throw off itself, or a part of itself, except some living creature. They have used, as an example, water flying from the periphery of a rapidly rotating wheel. This would merely imply that someone was trying to fasten worlds on the sun's periphery, but that the sun cast them off. Who that someone was they do not say; nor do they offer a reason as to how such thrown‑off substance came to be in the way of the sun in the first place. 38/6.11. It is equally erroneous to say that the presence of this or that planet, throws an influence on mortals, according to their birth under certain stars. It is this same astrological ignorance that attributes to the sun the throwing‑off of light and heat, and of possessing attraction of gravitation, and of throwing off rings to make planets of. 38/6.12. For this and that, man has ever sought the cause in corporeal things; he builds up certain tables and diagrams, and calls it science or philosophy. If, one morning he puts on the left shoe first, and something happens that day, then by that shoe he proves a new philosophy. By the tides, he proves the cause of the moon; or by the moon, the cause of the tides. Yes, he searches for explanation by anything under the sun that is corporeal, rather than search in the subtle and potent, unseen worlds. 38/6.13. Let it be premised, then, that the etherean firmament (which the world's people commonly call outer space or simply space) is not a waste and interminable nothingness; but that, on the contrary, it is in many regions, even between the earth and the sun, sufficiently dense for a corporeal man to dwell upon, and to walk about, even as on the earth. Some of these are as transparent as water or clear glass, and some opaque. Some of these etherean worlds are as large as the earth, and some a thousand times larger. Some are like immense facsimiles of snowflakes; with arches a thousand miles high and broad. Some of them are like oceans of water; some transparent and some opaque; and some of them are dense clouds of ashes. But so great are the numbers and so vast the varieties of these billions of etherean worlds, that description is impossible. Yet, by the telescopic power of the earth's vortexian lens, these worlds are magnified so as to seem to be nonentities. 38/6.15. When making observations with the spectroscope, these otherwise unseen worlds are sometimes seen; but usually the spectroscope reveals only the refraction of high altitudes in the earth's vortex. It is an error to say the spectrum divides the sun's rays per se. It is an error to say the spectroscope has revealed certain colors in the atmosphere or photosphere of the sun or other stars. 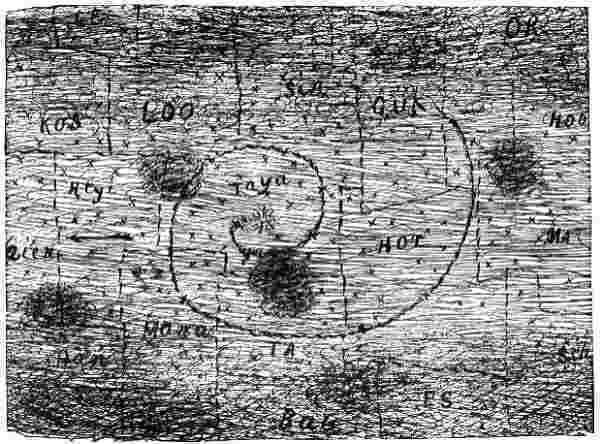 Its revelations, for the most part, pertain to what is contained in the vortexian lens of the earth, no matter whether the view is toward the sun or another star. 1673 Earth scientists calculate the distance to the sun to be about 93 million miles (150 million kilometers); but the actual distance would be about 86 million miles (138 million km). In other words, earth scientists thinking it is a straight line to the sun, unwittingly calculate the arc (curved path) of the light, and announce that as the shortest distance. Whereas geometrically speaking, if instead of following the light (c'vortexian currents) arching around the spiral, one went straight to the end point, the distance would be about 86,000,000 miles. 1675 This gives rise to various possibilities and questions, for example: Could this be because (1) the central sun planet and its satellites rotate around a barycenter within the photosphere; or (2) the sun planet is in the stage of skin (crust) formation, and its diameter changes from time to time, varying by 3000 miles to 30,000 miles from the photosphere (which variance is about 1/3 of 1 percent, to 3 percent, of the sun's diameter); or (3) the sun body is more oblate than its photosphere? Already, scientists, around 150 ak, have discovered a layer about 3000 miles below the surface of the photosphere. Notice that this was some 120 years after Oahspe mentions the 3000 miles. 1676 These are what we would call moons, asteroids, and perhaps nebular bodies, but orbiting within the body of the photosphere, and above the surface of the sun planet. The "body of the photosphere" would be the area between the sun planet's body and the outer surface of the photosphere. 1677 This suggests most have elliptical orbits, and so, when seen, should be approaching or at their farthest distance from the sun planet. 1678 In the words of electricity, the voltage (intensity, push) would be the same whether on the sun or on a planet, but the amperage (volume, amount of current) at the sun would be greater than the amperage at the planets. As power, i.e., wattage (W), is calculated in direct current as voltage (E) multiplied times amperage (I), that is, W = E x I, we can see that because the voltage (E) is the same at the sun or earth, and because the amperage (I) is greater at the sun, then Wattage (W), i.e., power, is greater at the sun. Thus, for example, if the vortexyan voltage was, say, ten volts and the amperage of the sun was fifteen amps, and the amperage of the earth was one amp, then the sun power would be W = E x I or 150 = 10 x 15, or 150 watts; and the earth would be 10 = 10 x 1, or 10 watts. This is equivalent to a 10-watt light bulb (the earth) compared to a 150-watt light bulb (the sun). Although not to scale, as percentage of wattage at the photosphere in reality would be much higher compared to earth, yet the principle is demonstrated. 1679 Instead, the cause lies with the c'vortex. 1680 As to the cause of these vortices, see Book of Jehovih, 04/3.3-7.